The QTableView class provides a default model/view implementation of a table view. A QTableView implements a table view that displays items from a model. This class is used to provide standard tables that were previously provided by the QTable class, but using the more flexible approach provided by Qt's model/view architecture. The QTableView class is one of the Model/View Classes and is part of Qt's model/view framework. QTableView implements the interfaces defined by the QAbstractItemView class to allow it to display data provided by models derived from the QAbstractItemModel class. You can navigate the cells in the table by clicking on a cell with the mouse, or by using the arrow keys. Because QTableView enables tabKeyNavigation by default, you can also hit Tab and Backtab to move from cell to cell. The table has a vertical header that can be obtained using the verticalHeader() function, and a horizontal header that is available through the horizontalHeader() function. The height of each row in the table can be found by using rowHeight(); similarly, the width of columns can be found using columnWidth(). Since both of these are plain widgets, you can hide either of them using their hide() functions. Rows and columns can be hidden and shown with hideRow(), hideColumn(), showRow(), and showColumn(). They can be selected with selectRow() and selectColumn(). The table will show a grid depending on the showGrid property. The items shown in a table view, like those in the other item views, are rendered and edited using standard delegates. However, for some tasks it is sometimes useful to be able to insert widgets in a table instead. Widgets are set for particular indexes with the setIndexWidget() function, and later retrieved with indexWidget(). By default, the cells in a table do not expand to fill the available space. You can make the cells fill the available space by stretching the last header section. Access the relevant header using horizontalHeader() or verticalHeader() and set the header's stretchLastSection property. To distribute the available space according to the space requirement of each column or row, call the view's resizeColumnsToContents() or resizeRowsToContents() functions. For some specialized forms of tables it is useful to be able to convert between row and column indexes and widget coordinates. The rowAt() function provides the y-coordinate within the view of the specified row; the row index can be used to obtain a corresponding y-coordinate with rowViewportPosition(). The columnAt() and columnViewportPosition() functions provide the equivalent conversion operations between x-coordinates and column indexes. QTableView is styled appropriately for each platform. The following images show how it looks on three different platforms. Go to the Qt Widget Gallery to see its appearance in other styles. A Windows XP style table view. A Macintosh style table view. A Plastique style table view. See also QTableWidget, View Classes, QAbstractItemModel, QAbstractItemView, Chart Example, Pixelator Example, and Table Model Example. This property holds whether the button in the top-left corner is enabled. If this property is true then button in the top-left corner of the table view is enabled. Clicking on this button will select all the cells in the table view. This property is true by default. This property holds the pen style used to draw the grid. This property holds the style used when drawing the grid (see showGrid). This property holds whether the grid is shown. If this property is true a grid is drawn for the table; if the property is false, no grid is drawn. The default value is true. If this property is true, sorting is enabled for the table; if the property is false, sorting is not enabled. The default value is false. If this property is true then the item text is wrapped where necessary at word-breaks; otherwise it is not wrapped at all. This property is true by default. Note that even of wrapping is enabled, the cell will not be expanded to fit all text. Ellipsis will be inserted according to the current textElideMode. Constructs a table view with a parent to represent the data. Removes all row and column spans in the table view. Returns the column in which the given x-coordinate, x, in contents coordinates is located. Note: This function returns -1 if the given coordinate is not valid (has no column). This slot is called whenever columns are added or deleted. The previous number of columns is specified by oldCount, and the new number of columns is specified by newCount. This slot is called to change the index of the given column in the table view. The old index is specified by oldIndex, and the new index by newIndex. This slot is called to change the width of the given column. The old width is specified by oldWidth, and the new width by newWidth. Returns the column span of the table element at (row, column). The default is 1. See also setSpan() and rowSpan(). Returns the x-coordinate in contents coordinates of the given column. Returns the width of the given column. See also setColumnWidth(), resizeColumnToContents(), and rowHeight(). See also showColumn() and hideRow(). See also showRow() and hideColumn(). Returns the table view's horizontal header. See also setHorizontalHeader(), verticalHeader(), and QAbstractItemModel::headerData(). Returns the horizontal offset of the items in the table view. 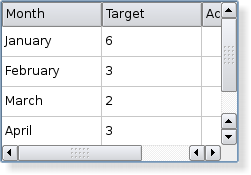 Note that the table view uses the horizontal header section positions to determine the positions of columns in the view. Returns the index position of the model item corresponding to the table item at position pos in contents coordinates. Returns true if the given column is hidden; otherwise returns false. Returns true if the given row is hidden; otherwise returns false. Moves the cursor in accordance with the given cursorAction, using the information provided by the modifiers. Paints the table on receipt of the given paint event event. Resizes the given column based on the size hints of the delegate used to render each item in the column. Resizes all columns based on the size hints of the delegate used to render each item in the columns. Resizes the given row based on the size hints of the delegate used to render each item in the row. Resizes all rows based on the size hints of the delegate used to render each item in the rows. Returns the row in which the given y-coordinate, y, in contents coordinates is located. Note: This function returns -1 if the given coordinate is not valid (has no row). This slot is called whenever rows are added or deleted. The previous number of rows is specified by oldCount, and the new number of rows is specified by newCount. Returns the height of the given row. See also setRowHeight(), resizeRowToContents(), and columnWidth(). This slot is called to change the index of the given row in the table view. The old index is specified by oldIndex, and the new index by newIndex. This slot is called to change the height of the given row. The old height is specified by oldHeight, and the new height by newHeight. Returns the row span of the table element at (row, column). The default is 1. See also setSpan() and columnSpan(). Returns the y-coordinate in contents coordinates of the given row. Selects the given column in the table view if the current SelectionMode and SelectionBehavior allows columns to be selected. 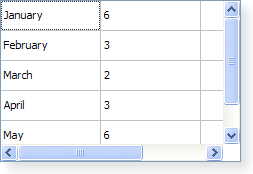 Selects the given row in the table view if the current SelectionMode and SelectionBehavior allows rows to be selected. If hide is true the given column will be hidden; otherwise it will be shown. See also isColumnHidden() and setRowHidden(). Sets the width of the given column to be width. Sets the widget to use for the horizontal header to header. See also horizontalHeader() and setVerticalHeader(). Sets the height of the given row to be height. If hide is true row will be hidden, otherwise it will be shown. Selects the items within the given rect and in accordance with the specified selection flags. Sets the span of the table element at (row, column) to the number of rows and columns specified by (rowSpanCount, columnSpanCount). See also rowSpan() and columnSpan(). Sets the widget to use for the vertical header to header. See also verticalHeader() and setHorizontalHeader(). See also hideColumn() and showRow(). See also hideRow() and showColumn(). Returns the size hint for the given column's width or -1 if there is no model. If you need to set the width of a given column to a fixed value, call QHeaderView::resizeSection() on the table's horizontal header. If you reimplement this function in a subclass, note that the value you return will be used when resizeColumnToContents() or QHeaderView::resizeSections() is called. If a larger column width is required by either the horizontal header or the item delegate, the larger width will be used instead. See also QWidget::sizeHint and horizontalHeader(). Returns the size hint for the given row's height or -1 if there is no model. If you need to set the height of a given row to a fixed value, call QHeaderView::resizeSection() on the table's vertical header. If you reimplement this function in a subclass, note that the value you return is only used when resizeRowToContents() is called. In that case, if a larger row height is required by either the vertical header or the item delegate, that width will be used instead. See also QWidget::sizeHint and verticalHeader(). Sorts the model by the values in the given column in the given order. Returns the table view's vertical header. See also setVerticalHeader(), horizontalHeader(), and QAbstractItemModel::headerData(). Returns the vertical offset of the items in the table view. 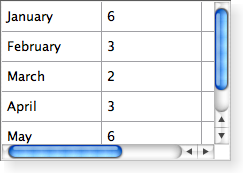 Note that the table view uses the vertical header section positions to determine the positions of rows in the view.